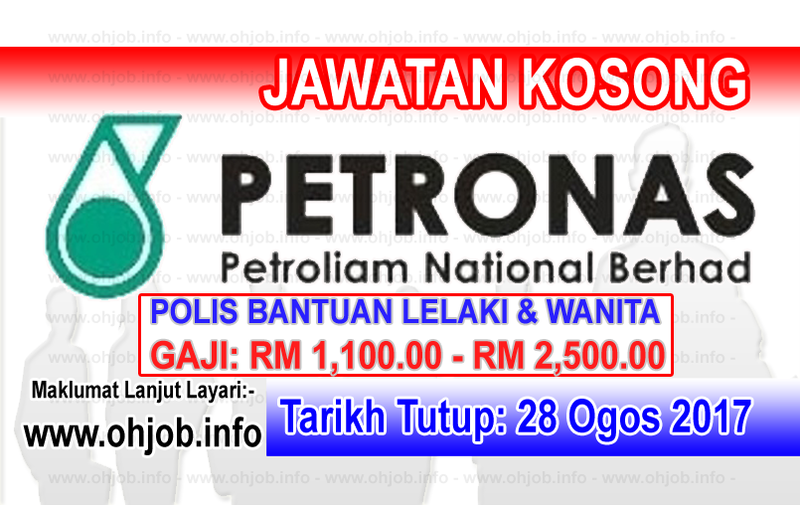 PETRONAS, short for Petroliam Nasional Berhad (Malaysian National Oil Company Inc.), is a Malaysian oil and gas company that was founded on 17 August 1974. Wholly owned by the Government of Malaysia, the corporation is vested with the entire oil and gas resources in Malaysia and is entrusted with the responsibility of developing and adding value to these resources. Petronas is ranked among Fortune Global 500's largest corporations in the world. Fortune ranks Petronas as the 75th largest company in the world in 2013. Fortune also ranks Petronas as the 12th most profitable company in the world and the most profitable in Asia. Terima Kasih Kerana Membaca Dan Menyemak Jawatan Kosong Petroliam Nasional Berhad - PETRONAS (28 Ogos 2017) Selamat Memohon Dan Semoga Berjaya Kami Ucapkan, Sila LIKE Facebook Page Kami Dan Kongsikan Kepada Semua.